When HBO Game of Thrones Season 5 Episode 9, ‘Dance of Dragons’, first aired, in June 2015, viewers with an interest in Greek myth recognised the harrowing scene of the death of Shireen Baratheon as a re-telling of the story of Greek princess Iphigenia. In texts featuring the stories surrounding the Trojan War, and most notably Euripides play Iphigenia at Aulis, King Agamemnon’s daughter Iphigenia is sacrificed in order for the Greeks to be rewarded with fair winds to allow them to sail to Troy. At the beginning of the play Agamemnon is wavering in his resolve to sacrifice his daughter to Artemis, following a prophesy from the seer Kalchas. He is persuaded by his brother Menelaus that he must go through with this or fear the wrath of the Greek army. Iphigenia at first pleads for her life, but then becomes a ‘heroic’ sacrificial victims who dies for Greece. At the end of the play she is sacrificed offstage, and a messenger reports that as the knife struck she was replaced by a deer, and so the goddess Artemis must have saved her. Her mother Clytemnestra remains sceptical. She eventually avenges her daughter’s death by killing her husband Agamemnon on his return from Troy, as represented in Aeschylus’ play Agamemnon. In HBO Game of Thrones, though not (so far) in George RR Martin’s Songs of Ice and Fire books, priestess Melisandre advises Stannis Baratheon that if he wants to win the battle for Winterfell and become King of Westeros he must sacrifice his daughter Shireen to the Lord of Light, R’hllor. 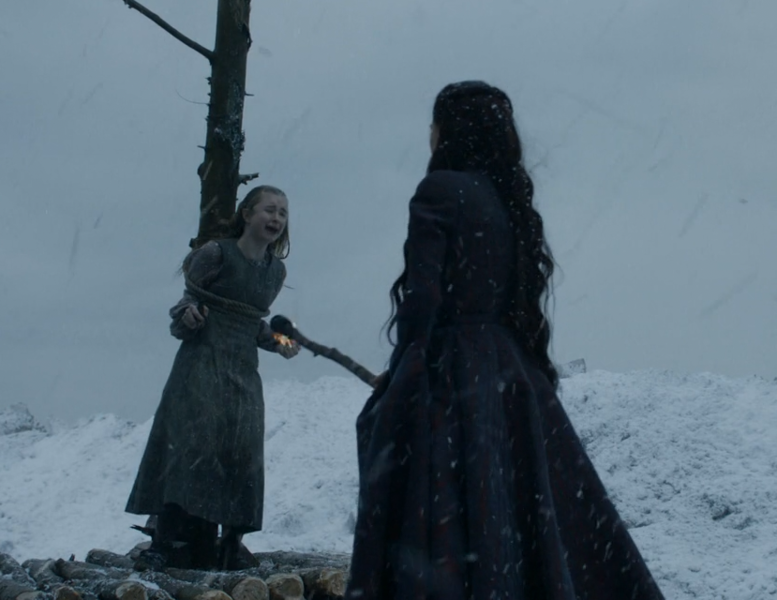 As a princess and daughter of Stannis, Shireen has king’s blood, which has magical properties. 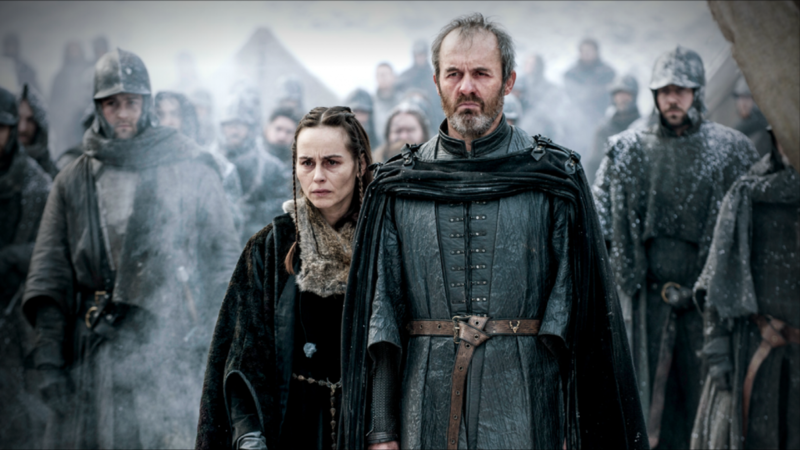 Stannis, like Agamemnon, is at first reluctant, but his wife Selyce, who could be described as a religious fanatic, finds it a ‘great honour’ for her daughter to be sacrificed. At first Shireen wants to help her father, but as she is dragged towards the pyre where she is to be burned she screams out to her father and then her mother to save her. Selyce regrets her decision but is prevented from saving Shireen from the flames. Selyce does not take revenge on her husband, like Clyemnestra, but instead hangs herself. It is left to the female warrior Brienne of Tarth to take the role of the vengeful woman in killing Stannis at the end of the season. In the same episode we also saw a fighting pit in Meereen depicted as a Roman arena where combatants fight to the death, and Queen Daenerys rescued on the back of a dragon, like Medea at the end of the Euripides play fleeing Corinth in a chariot pulled by dragons. Why had Game of Thrones suddenly gone all classical? George R.R. Martin, who is co-executive producer of the HBO series as well as writer of the Songs of Ice and Fire books on which the series is based, has stated that his primary historical influence is Medieval, although he has drawn on ancient history for some elements in his books. An example is the wall which protects the seven kingdoms, manned by the Night’s Watch from their headquarters at Castle Black, which is based on Hadrian’s Wall, which Martin visited in 1981. However, there is a writer who is intimately familiar with Greek myth involved in the show; David Benioff, series showrunner and previously scriptwriter for the film Troy (2004). Benioff was aware of the story of Iphigenia, and her death is one of the scenes cut from his original screenplay, although in the film Agamemnon is killed by a vengeful woman, Briseis. Martin may have suggested the death of Shireen for the series, even though this is a departure from the novels where Shireen and Selyce are separated from Stannis on his march to Winterfell. He is well-known for killing off his characters in shocking circumstances, most notably the red wedding, where many of the principal characters die. However, I would suggest that it is Benioff who is drawing on the story of Iphigenia for the sacrifice of Shireen, replacing the scene that was never filmed for Troy. Whether or not my conjecture is correct the comparison between Iphigenia and Shireen is still a useful one for readers and viewers. This makes us think about the motivation of their fathers (religious or a power play?) and their mothers. It also makes us think about how both beautiful Iphgenia and disfigured Shireen, who miraculously survived the disease greyscale, are both special individuals marked out for sacrifice. We also might question whether being a willing sacrifice could ever be ‘heroic’. When Iphigenia is taken away to be killed, wouldn’t she really have screamed like Shireen? It will be interesting to see how the story plays out when Martin’s long-awaited and overdue novel, The Winds of Winter, is completed and published. Image credits: Melisandre sacrifices Shireen and Stannis and Selyce watch the sacrifice from Game of Thrones wiki.